#3 Book in the Husker the Mule series!! It has arrived just in time for Christmas 2018. Now released is Husker the Mule: Adventure Awaits. Young readers will go on an adventure with Carter and Husker where they learn to overcome fears and trust in themselves and others. Also, meet a new character to the series – Caty Lou! Once again illustrated by the award-winning western artist, Teri McTighe of Faith, S.D., the book is delightfully brought to life for readers. 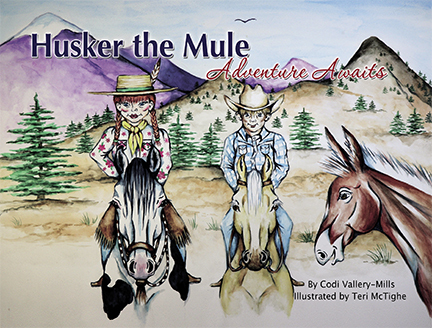 Husker the Mule books may be bought at The Olive Branch or Cenex Travel Plaza in Belle Fourche, SD; Sturgis Photos & Gifts in Sturgis, SD or on Amazon.